This hawk is Buteo lineatus. 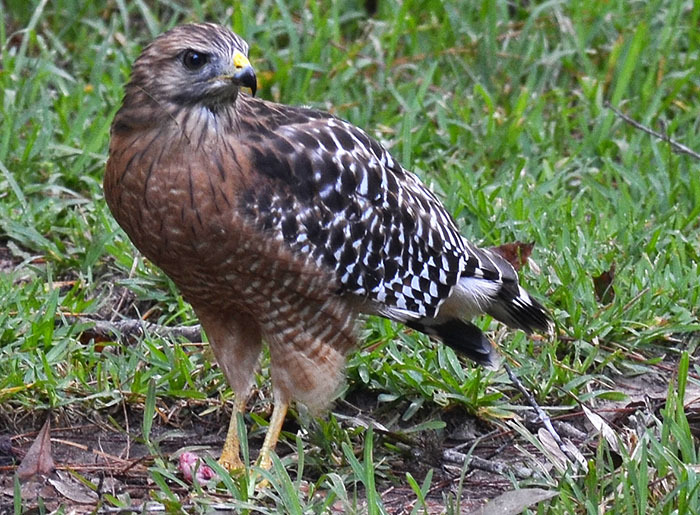 Citing from the second link: "A hawk of the woodlands, often heard before it is seen. The clear whistled calls of this hawk are conspicuous, especially in spring; in the east, Blue Jays often give a near-perfect imitation of this call. Over much of eastern North America the Red-shoulder has become uncommon, sticking closely to the remaining forests. Populations in Florida and California are often more visible, perhaps adapting better to open habitats." They usually hunt by watching from a perch and feed on small mammals, amphibians, reptiles, birds, occasionally fish, and rarely carrion.